Just before the Chicago Blackhawks geared up for a team practice on Friday night, Jonathan Toews invited four-year-old Nicolas Skretkowski onto the ice as his personal guest. Nicholas was there as part of the Make-A-Wish Foundation. Nicholas – who suffers from Wilm’s tumor and Strabismus - may only be four, but he’s one of the biggest fans of the game – and of Toews in particular. 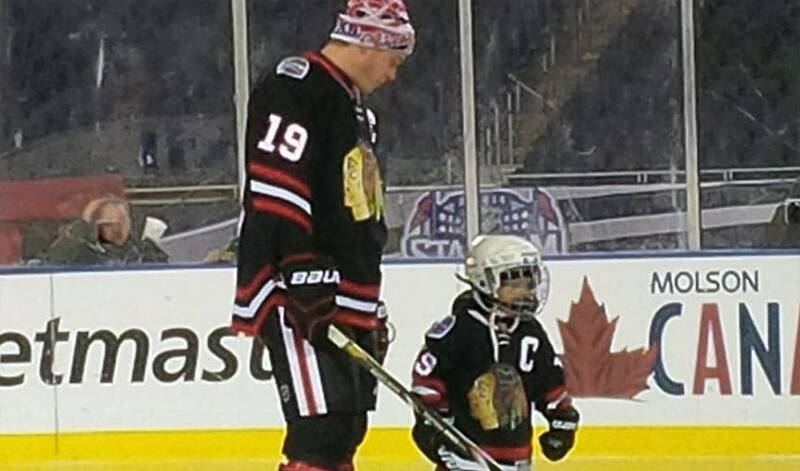 When Nicholas skated out onto the ice at Soldier Field, he was treated to one-on-one time with his hockey hero. It was a moment his family was incredible excited and proud to see. In addition to sharing the ice with his idol, Nicholas was able to have a team photo taken with Chicago Blackhawks players, and even had his own stall inside the Blackhawks locker room right next to captain, Jonathan Toews. "It was great ... not just to be out on the ice with him, but to have him in here with the guys," Toews said to NHL.com. "He seemed a little shy at first, but then kind of got more comfortable. Someone asked him about his favorite team and his favorite players. He seemed like he knew a lot for a little guy."